Muslim woman Samantha Elauf (R), who was denied a sales job at an Abercrombie Kids store in Tulsa in 2008, stands with her mother Majda outside the U.S. Supreme Court . 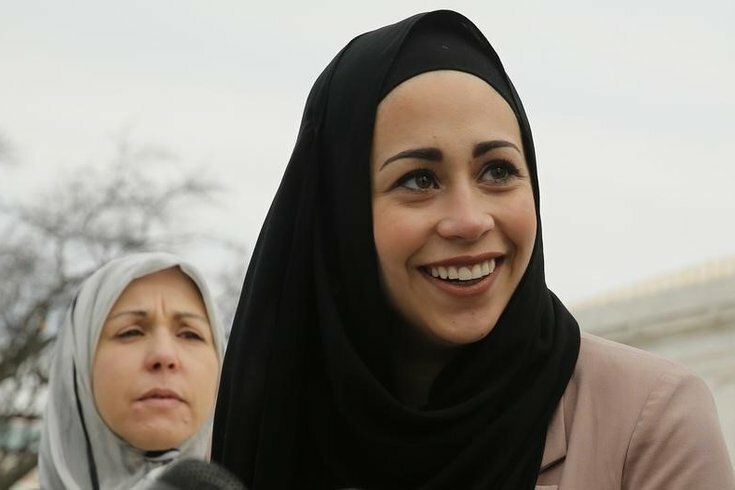 The U.S. Supreme Court on Monday ruled in favor of a Muslim woman who sued after being denied a job at an Abercrombie & Fitch Co clothing store in Oklahoma because she wore a head scarf for religious reasons. On an 8-1 vote in an important religious rights case, the court handed a victory to the U.S. Equal Employment Opportunity Commission (EEOC), a federal agency that sued the company on behalf of Samantha Elauf. She was denied a sales job in 2008 at an Abercrombie Kids store in Tulsa when she was 17. The legal question before the court was whether Elauf was required to ask for a religious accommodation in order for the company to be sued under the 1964 Civil Rights Act, which, among other things, bans employment discrimination based on religious beliefs and practices. Monday's ruling was the second decision by the high court during its current term in favor of a Muslim alleging discrimination. In January, the justices found that an Arkansas policy prohibiting inmates from having beards violated the religious rights of a prisoner who had wanted to grow one in accordance with his Muslim beliefs. The court has taken an expansive view of religious rights. Last year, it sided with a Christian-owned company that objected on religious grounds to providing health insurance coverage for certain contraceptives. Abercombie said in a statement that the case will continue, noting that the court had not determined that discrimination took place. "We will determine our next steps in the litigation," the statement said. The court, in an opinion by Justice Antonin Scalia, ruled that Elauf needed only to show that her need for an accommodation was a motivating factor in the employer's decision. Elauf was wearing a head scarf, or hijab, at the job interview but did not specifically say that, as a Muslim, she wanted the company to give her a religious accommodation. "A request for accommodation ... may make it easier to infer motive, but it is not a necessary condition of liability," Scalia wrote. Justice Clarence Thomas was the sole dissenter. He said that "mere application of a neutral policy" should not be viewed as discrimination. The company denied Elauf the job on the grounds that wearing the scarf violated its "look policy" for members of the sales staff, a policy intended to promote the brand's East Coast collegiate image. Abercombie said in its statement that in April it replaced the "look policy" with "a new dress code that allows associates to be more individualistic" while also changing hiring practices so that "attractiveness" is no longer a factor. Muslim groups said in a friend-of-the-court brief in support of Elauf that employment discrimination against Muslims is widespread in the United States. Often, the act of a woman wearing a head scarf is what triggers the discrimination, according to the brief. The EEOC has reported that Muslims file more employment claims about discrimination and the failure to provide religious accommodations than any other religious group. The case involving a young Muslim woman alleging workplace discrimination in the American heartland was decided by the top U.S. court at a time when some Western nations are struggling with culture clashes relating to accommodating Muslim populations. The United States has not, however, faced the same tensions as some European countries including France. The case is EEOC v. Abercrombie & Fitch, U.S. Supreme Court, No.14-86.